When I first saw the announcement of My First Castle Panic from Fireside Games, I was ecstatic. The “My First” take on board games has been a fantastic way to introduce our young ones to games we know and love. But then I got curious. Castle Panic isn’t a particularly difficult game. As a cooperative experience, I could even quarterback a little and explain why I was making recommendations, and my kids would pick it up. Right? Wrong. Playing Castle Panic (a fantastic game) with my 4-year-old felt more like giving instructions to an unwilling robot. He wasn’t enjoying himself, and I wasn’t enjoying him not enjoying himself. We made it through, but it wasn’t an experience begging for a repeat. So, maybe there is a place for an even more simplified version of this already great gateway game, so we’re going to dig inside the box to take a look. Have Justin De Witt and the Fireside Games crew struck the right balance between simple rules and engaging game play? My First Castle Panic is a cooperative tower (castle) defense game for 1-4 players ages 4+ that plays in just 20 minutes. Team up and protect the castle from monsters coming to knock it down! Throw the monsters in the dungeon and save the castle! As you would expect, setup is incredibly simple. Lay out the board, place the castle on the castle space, and the wall on the space in front of it. Find the three starting monsters (they have a star on them). Place them on the first three spaces of the board, beginning with the start space. Lay out the remaining monster tokens face down near the board. We like to put the bottom of the box behind the castle because it is the dungeon where defeated monsters go. Shuffle the cards, deal one to each player, and begin with the youngest player, playing clockwise. Gameplay is very similar to Castle Panic. On their turn each player draws a card, plays a card OR asks for help, moves the monsters, and draws another monster token. After drawing a card, each player either plays a card or asks for help. 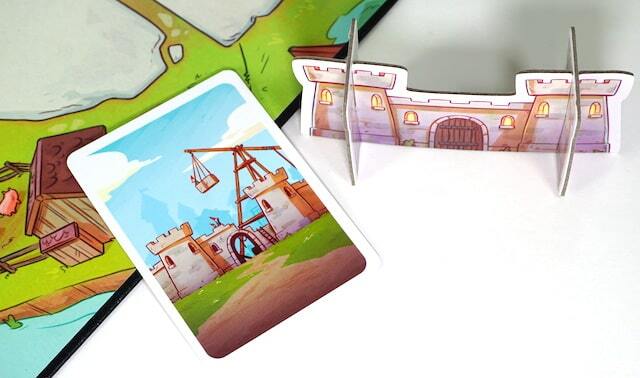 These wonderfully illustrated cards by Cam Kendell feature champions of the castle (albeit a bit younger than the fighters in regular Castle Panic). Each card also sports one or more shapes (square, triangle, circle) in one or more colors (red, green, blue). Kick a monster back to the pile! To use a card to defeat a monster, the card must have a matching color and shape to a space with a monster on it. The player discards the card to banish the monster to the dungeon! If the active player does not have a card they can use, they can ask for help, which allows another player to play a card in the active player’s place. Work together to defeat the monsters! There are a few special cards too. These allow you to rebuild the wall or boot a single monster from the board back into the monster stack. “Runner” gets placed in front of the monster closest to the castle. Next, the player moves all monster tokens one space closer to the castle. If a monster would run into the wall in front of the castle destroys the wall but is sent to the dungeon. If a monster would run into the castle, the game is over! Finally, the player draws a new monster token and places it on the start space. There are a few special monsters with special abilities as well (e.g. the “Shover”, which moves all of the monsters a second time after it is placed). My First Castle Panic includes some variations to make it easier or harder, and even has special rules for solo play. I was incredibly curious how well My First Castle Panic would go with our kids. I could tell pretty quickly that it was likely to work out, though. After five minutes of walking my non-reading four-year-old how to play, he was playing solo with almost no help. His older brother and sister have also enjoyed the challenge of protecting the castle. Fireside has done an excellent job with My First Castle Panic, distilling the game down to its most fundamental parts. In Castle Panic the creatures are attacking the castle from six equal sections that form a circle around the castle. In My First Castle Panic, players only have to worry about a single, but much longer, path. The repeating shape icons give players multiple opportunities to knock off monsters, making it easier to stay afloat. Most important, though, is the strong iconography. My First Castle Panic is designed for players as young as four, which means it can’t depend on reading. 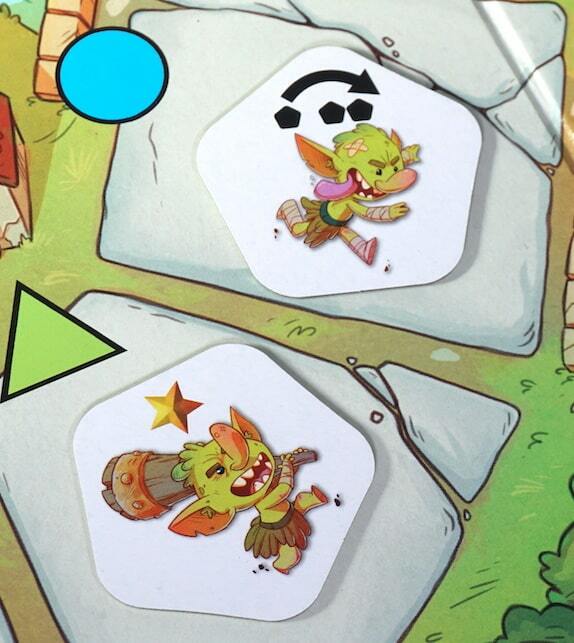 Matching the shapes and colors is simple, and the icons that represent the special monsters’ powers are clear. 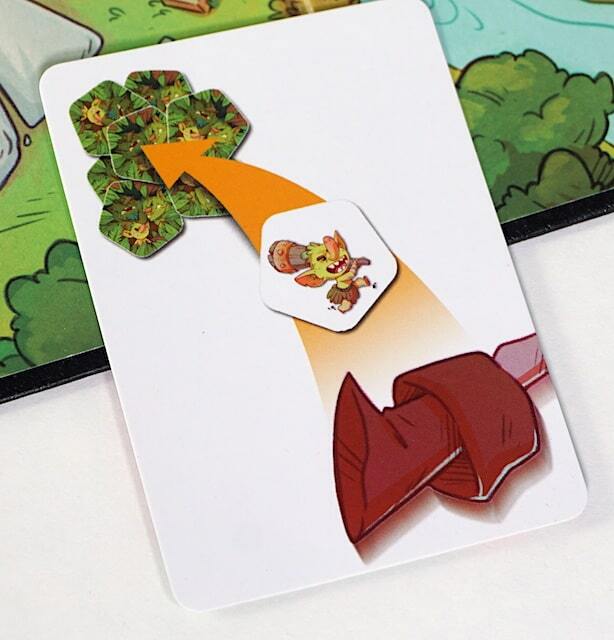 The adjustment from trading cards to asking for help greatly simplifies the strategy over the original Castle Panic, and It allows other players to simply step in when needed. 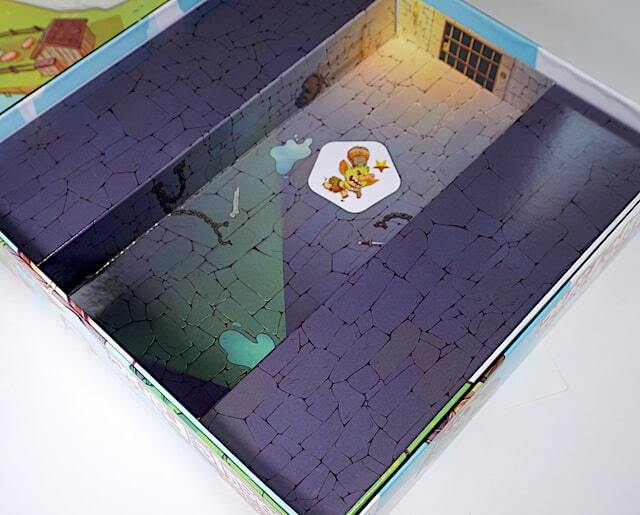 My favoritest is the nice printing of a dungeon on the bottom of the box! The pieces can be stored assembled, but they’re not particularly hardy. Because of this, our castle is already showing significant wear along the edges. This is hardly a deal breaker, but for a game with a target demographic of children ages 4-7, I would have thought the cardboard would be a little tougher. My biggest knock on the game is that the sweet spot for it is fairly small. 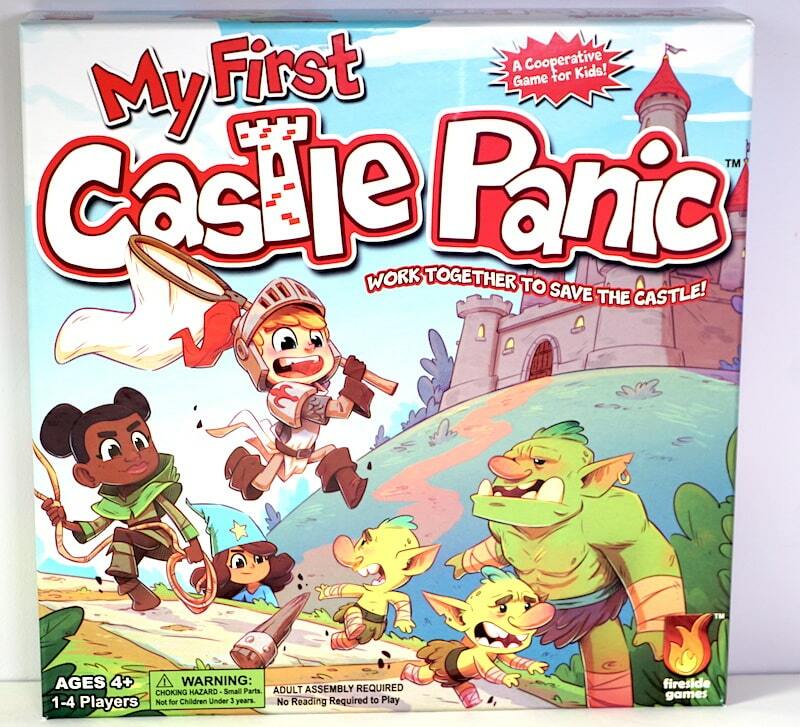 Board gamers expect games to linger on their shelves for a fairly long time, but fledgling gamers will likely age out of My First Castle Panic fairly quickly. However, it’s a wonderfully adorable introduction to the Castle Panic line and it costs less than $20. 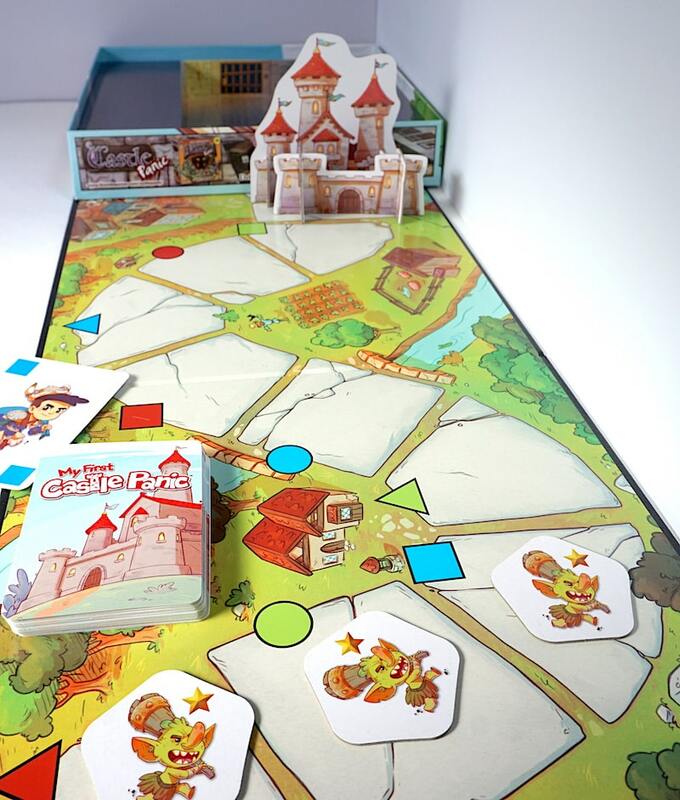 My First Castle Panic makes a fantastic gift for the youngest board gamers in your life, and a great entry into the wide world of board gaming. 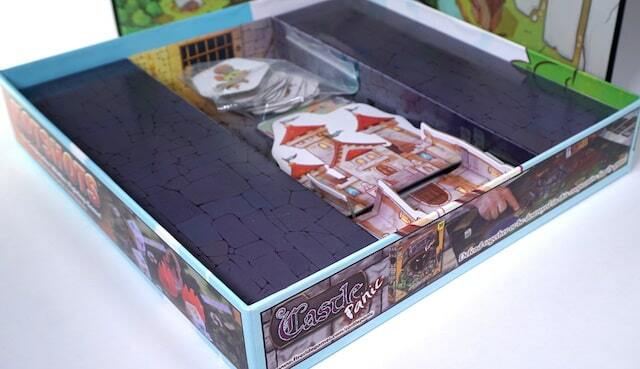 You can get your own copy of My First Castle Panic on Amazon or at your friendly local game store. Ready to step up your game? The Fireside classic Castle Panic is also readily available. There are plenty of expansions as well, making Castle Panic a game that can grow with your family! The Family Gamers received a promotional copy of My First Castle Panic for this review.